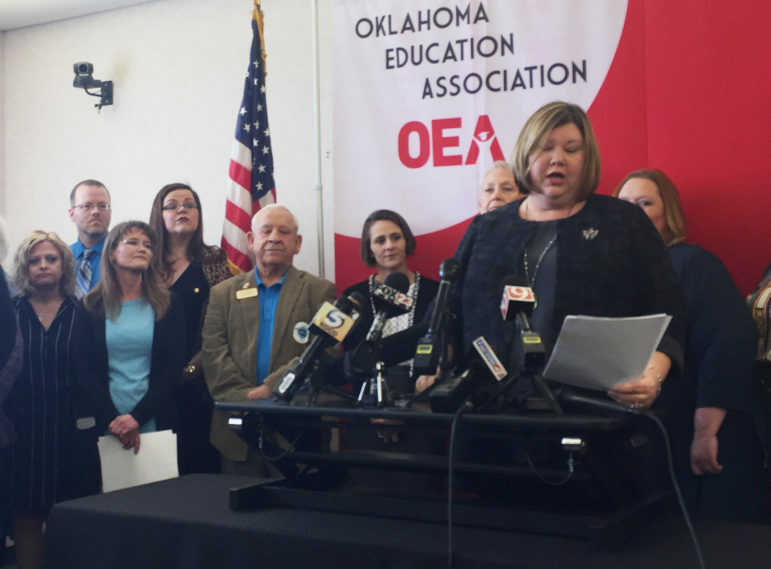 Oklahoma Education Association President Alicia Priest announces that teachers will walk out of public schools on April 2 unless the Legislature approves nearly $1.5 billion in new revenue for teacher and state employee pay raises and higher education funding. Story by Trevor Brown, Paul Monies, Jeff Raymond, Ben Botkin and Jennifer Palmer. But signs of headwinds emerged quickly, foreshadowing a political stalemate that could pit hundreds of educators against a Legislature that has repeatedly quashed attempts to raise revenue for teacher pay raises. The Oklahoma Education Association announced that educators will walk out on April 2 unless lawmakers find nearly $1.5 billion in new revenue, including $812 million for the upcoming fiscal year. The money would pay for teacher and state employee pay raises and restore hundreds of millions in education funding cuts. The teachers’ union, however, didn’t spell out how to pay for the plan. Instead, OEA President Alicia Priest suggested lawmakers revisit earlier proposals that failed to get the three-fourths vote required of revenue bills. Among those was the Step Up Oklahoma plan, pitched by civic and business leaders, that would have raised taxes on cigarettes, motor fuel and oil and gas production. Other Step Up changes were proposed in separate bills. But early indications were that legislators’ lines in the sand weren’t shifting. After the announcement, Oklahoma Watch contacted more than a dozen key House members who had opposed the previous proposals. All said the walkout threat won’t convince them to flip their votes unless they receive significant concessions. The legislators – Oklahoma Watch reached out to 35 of them – included a strange-bedfellows mix of fiscally conservative Republicans reluctant to consider most tax increases and Democrats seeking a tax package that draws more from the oil and gas industry and higher earners. All had voted no on the Step Up Oklahoma plan. The Step Up proposal had gained the support of 63 House members, out of 101, which was well below the 76 votes needed to pass. Most of the lawmakers who voted against the plan didn’t return calls and emails Thursday, reflecting perhaps a wish to remain tight-lipped until the current series of events plays out further. But more than a dozen who responded said that if House leaders were to resurrect the Step Up revenue proposal, it would likely fail again. Other Republicans, including Reps. Kevin Calvey, R-Oklahoma City; John Bennett, R-Sallisaw; Kevin West, R-Moore; and Jeff Coody, R-Grandfield, said they would still oppose the Step Up or similar plans if asked to vote again. “I am 100 percent in favor of giving Oklahoma’s teachers a pay raise, but I am absolutely opposed to taxing Oklahomans excessively in order to pay for that raise,” Coody said. Five of the six Republicans who responded suggested there are other ways to find money for teachers. Their plans, which include finding wasteful spending through audits, are unlikely to generate the large sum that OEA is demanding, and GOP leaders have yet to take those plans up. Several of the GOP lawmakers suggested putting components of the Step Up plan to a statewide vote. A referendum, however, would occur long after the educators’ April 2 walkout deadline. Rep. Carl Newton, R-Cherokee, who wasn’t present for the Step Up vote, noted that November’s failed A+ plan received a larger number of yes votes than Step Up despite oil and gas industry opposition. “I think this plan has the best chance to succeed if anything could pass,” he said. The 28-member House Democratic Caucus issued a statement Thursday supporting the “right of teachers to organize” and pledging to work to find money for pay raises. But 11 of the 17 Democrats who opposed the Step Up plan reiterated their demand that a revenue package must not rely as much on regressive taxes, such as cigarette and fuel taxes, to win their support. Regressive taxes tend to hit lower- and middle-income taxpayers in greater proportions. Bennett was joined by Reps. Regina Goodwin, D-Oklahoma City; Emily Virgin, D-Norman; Matt Meredith, D-Tahlequah; Steve Kouplen, D-Beggs; Colin Walke, D-Oklahoma City; Eric Proctor, D-Tulsa; and Monroe Nichols, D-Tulsa, in saying Thursday that upping gross production taxes would be a starting point to win their votes. The group is seeking to increase the gross production rate to at least 5 percent rather than Step Up Oklahoma’s proposed 4 percent rate for the first 36 months of production, when a well’s lifetime production often is greatest. The current gross production tax rate is 2 percent for the first three years, after which it climbs to 7 percent. Kouplen said Democrats want additional revenue, such as from higher income taxes on the wealthy, because even the $580 million Step Up plan provided for a $5,000 teacher raise but raised no new money to restore cuts to classroom activities. “That was a big reason I was against Step Up. It didn’t address four-day (school) weeks, more classroom funding or attracting new teachers,” he said. But proposals that could win over the entire Democratic caucus risk losing critical votes on the GOP side. Senate Pro Tempore Mike Schulz, R-Altus, said there are enough votes in the Senate to pass the Step Up plan or a similar one. But, he said, looking at additional funding sources and adding concessions for Democrats likely would doom the effort in both chambers. Schulz said he doesn’t see the Legislature giving in to the teachers union’s demands. And he said it’s a “50-50” chance that any pay raise can be passed. This seemingly leaves the Legislature at the same impasse that has frustrated lawmakers and constituents in the past few years. But it remains to be seen whether hundreds, or thousands, of teachers shutting down classes for days or weeks will break the logjam. In warning lawmakers that “schools will stay closed until we get what we want,” OEA President Alicia Priest said the pressure is on the Legislature to act.